Well-known British philanthropists, the Ronson family, who have already contributed greatly to Israeli education and even established a number of schools in the 1980s, made a special visit to Israel to announce that in conjunction with Sci Tech Israel it will set up two innovation centers for sciences, technology and art studies in two schools in Ashkelon: Sci Tech Henry Ronson and Sci Tech Afridar Ronson, at a cost of 6 million shekels. 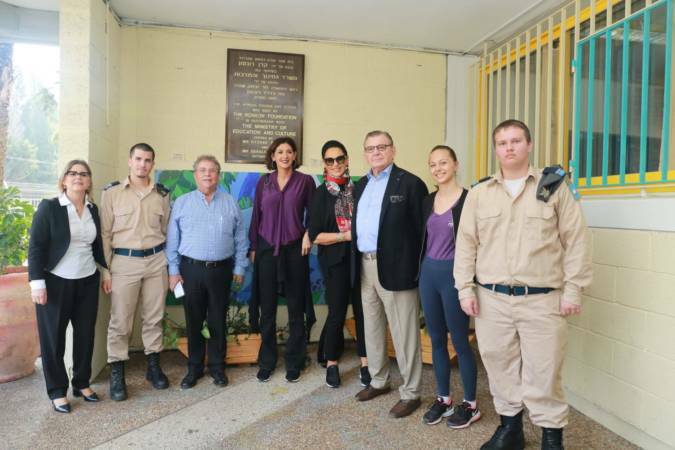 Mr. Gerald Ronson, his wife Gail and their daughter, Amanda visited the two school established in the 1980s in Ashkelon thanks to the family’s generous donations. The Ronson family came to Ashkelon for the inauguration of the new auditorium at Sci Tech Henry Ronson, which cost 1.5 million ILS. Also present at the ceremony was the director of the British UJIA in Israel, Mr. Natie Shevel, and Israel Sci Tech Director General, Zvi Peleg. The two schools, have benefitted from having a new auditorium, new restrooms, shading and synthetic grass in the schoolyard, covering of the classroom doors, and pedagogical boards at Sci Tech Afridar Ronson, and now they will be receiving another boost with the setting up of two innovation enters for the study of technology, science and the arts at a cost of a further six million shekels, to be shared by the Sci Tech Israel network. During the visit to Sci Tech Afridar Ronson, Gerald Ronson met with Yoel Rothschild, Head of the Sci Tech Israel R&D Administration, the school management staff, teachers and students to receive an explanation about the new development programs for Sci Tech’s iSTEAM model to promote entrepreneurship, innovation, technology and science. In the 1980s, in collaboration with the Israeli government, the Ronson family established three schools, the two in Ashkelon and Sci Tech Ronson Usfiya, in the aim of advancing education in Israel and encouraging students to study 21st-century fields including entrepreneurship, technology, sciences and innovation. The Ronson family’s agenda matches that of the Sci Tech Israel network, and this is how the collaboration between the two developed.